I must say I am enjoying my August project of listing things that I love. It is really making me more aware of the things in my life that make me smile. Today I would like to share a love that I sort of wish I wasn't addicted to. 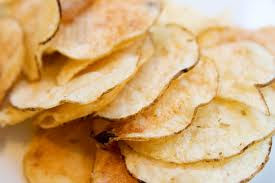 Potato Chips .....................Mmmmmm I love potato chips, any sort, except "salt and vinegar". They are my comfort food if I am feeling down. I enjoy a packet of chippies when I am going on a long drive, sitting watching a movie, munching while having a drink, just about anytime really. I actually have a love/hate relationship with potato chips because they are the one thing that will make me fall of the wagon when I am trying to eat healthy. My healthy eating will be going great when all of a sudden I find myself sitting munching on some chips. Now this may sound a bit weird to some but the funny thing is I know why I am addicted to potatoe chips. It was sort of breed into me because my Mum and Dad first met when they both worked in a "Potato Chip Factory". I have always thought of it as a bit of a family romantic story and I think I will always love chips. Now when I eat them I have a smile because I think about when Mum and Dads eyes met over the fryer or whatever. I'm smiling at this end Davine! That's cute that your parents met at a chip factory. Darlene - Glad I could make you smile. Yeah I always thought the chip factory meeting was a bit unique.